Dirty slide? 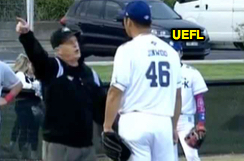 Australian Baseball League HP Umpire Michael Lyons ejected Geelong-Korea Manager Dae-Sung Koo and 3B Umpire Stewart Howe ejected pitcher Jin-Woo Kim (interference no call; QOCY) in the top of the 2nd inning of Saturday's Heat-Korea game. With two out and the bases loaded, Perth Heat batter Chris Betts hit a ground ball to Geelong-Korea right fielder Kwang-Min Kwon, who threw to catcher Sun-Gu Han, to shortstop Hwi-Yeon Park as batter-runner Betts slid into second base, resulting in a collision with the shortstop, who failed to catch the ball, ruled legal by 3B Umpire Howe, as Betts continued to advance, winding up at third base on the play, ruled a missed catch error at shortstop. Replays indicate Betts did not appear to intentionally interfere with a thrown ball (OBR 6.01(a)(10)), the throw appeared to sail into the runner, and, because no potential for a double play existed in regard to the play at second base, the bona fide slide rule interference provision (6.01(j)) does not apply, the call was correct. * At the time of the ejections, the Heat were leading, 5-0. The Heat ultimately won the contest, 15-2, in seven innings. Betts runs past the injured Geelong-Korea SS. *OBR 6.01(a)(10) states, "It is interference by a batter or a runner when—He fails to avoid a fielder who is attempting to field a batted ball, or intentionally interferes with a thrown ball." *OBR 6.01(j) does not apply ("for the purpose of breaking up a double play" is a chief criterion). Nonetheless, if 6.01(j) was applicable, the rule requires that a runner "begins his slide (i.e., makes contact with the ground) before reaching the base" and that "interference shall not be called where a runner’s contact with the fielder was caused by the fielder being positioned in (or moving into) the runner’s legal pathway to the base." The question for the umpire would then rest with whether the runner's slide was in front of the base and contact occurred due to the fielder's position in front of the base. The runner's right leg is on the ground. OBR 6.01(j) also states, "a slide shall not be a 'bona fide slide' if a runner engages in a 'roll block,' or intentionally initiates (or attempts to initiate) contact with the fielder by elevating and kicking his leg above the fielder’s knee or throwing his arm or his upper body." So, again, assuming this had been potential double play situation, the question is whether the runner intentionally elevated and kicked his leg above the fielder's knee. Naturally, with the fielder's knee on the ground and in front of the base, any contact would naturally be a kick above the knee. Thus, the question is whether the runner's action was 1) intentional and 2) elevated. From this video clip, though the slide looks late and high, I believe the runner would have contacted the ground at, but not necessarily in front of, the base; nonetheless, the contact would not have occurred (in this fashion) had the fielder not blocked the base. SIDEBAR: Whose Right is it Anyway? This wasn't a collision during an attempt to field a batted ball (it was a thrown ball), so the right-of-way here belongs to the runner. There is no obstruction here (if there was, note that it would be type A--play being made on the runner...dead ball award, etc. ), because the runner was not impeded in his attempt to run the bases (he successfully advanced to second, and then third, on this play). 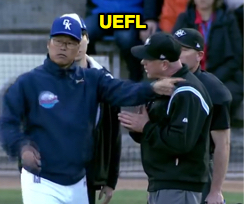 Pitcher Jim-Woo Kim also was ejected. Accordingly, had there been a potential double play that would have made 6.01(j) relevant, I would have had no interference (QOC for the umpires' INT no-call = Correct) simply because the fielder's act in blocking the runner's pathway to the base, which was necessitated by the throw into the runner, prevented further judgment relative to the runner's slide legality, since the slide was interrupted prior to the base...lest we forget, the fielder did not have the ball (and, anyhow, the fielder's positioning likely would have precluded his realistic opportunity to turn a double play, had there been a trailing runner; the throw could have ended up retiring the sliding runner, but would be very unlikely to afford a realistic opportunity to make a play on a runner at a different base). Gil's Call: Notwithstanding the legality of the slide in front of the base in the runner's sliding lane such that no elevated kick would have occurred had the fielder stood at or behind the base, I'd expect the League to issue a Heads Up alert for these two teams in the future for a potentially intentional retaliatory hit-by-pitch on this runner's return to the batter's box, if such an officiating warning program exists in the ABL.